I very much love brownies and bars because in addition to being delicious, they are so quick, easy and satisfying. You don’t always have time to make a special cake or pie, so brownies and bars are the ultimate lazy bakers delight. This is one of the reasons twocarolines.com has dozens of amazing ones to choose from, which will not stop us from adding to the list frequently. Whenever I come across a recipe I haven’t made before that looks great, I hop to it. These ones were unique and you can make them a variety of ways. In fact, I was in a rush and forgot to add the oatmeal to the bottom batter, so I laid a layer of it on top of the chocolate, swirled it in, and then dolloped the rest of the dough on and no one complained a bit! I’m posting as recommended though, because next time I won’t forget and I think it would be an even cooler texture experience. Either way, you’ll love these chewy, gooey, chocolatey oatmeal fudge bars. Grease a 9×13 inch baking pan – I just laid down parchment which worked out great, but if you grease with butter or even spray that will work well too. Preheat oven to 350. In a large mixer bowl cream the butter and brown sugar then add the eggs one at at time and the vanilla. In a small bowl sift flour, baking soda and salt then add that to the creamed mixture. Mix in the oats. In a heavy saucepan, mix the sweetened condensed milk with the chocolate chips and butter, heat until just melted and you can whisk it smooth. Stir in the vanilla and nuts if using. Spread two thirds of brown sugar dough into prepared baking pan. Spread the chocolate mixture on top, then drop remaining one third of brown sugar dough on top by spoonfuls. Even out the top in a pretty way. Bake at 350 for about 25-30 minutes – be sure it’s not still doughy when you take it out, you can tell when it’s set and a toothpick will come out with moist crumbs not wet dough. Cool for a good 15 minutes at least then cut into bars. Makes about 36. 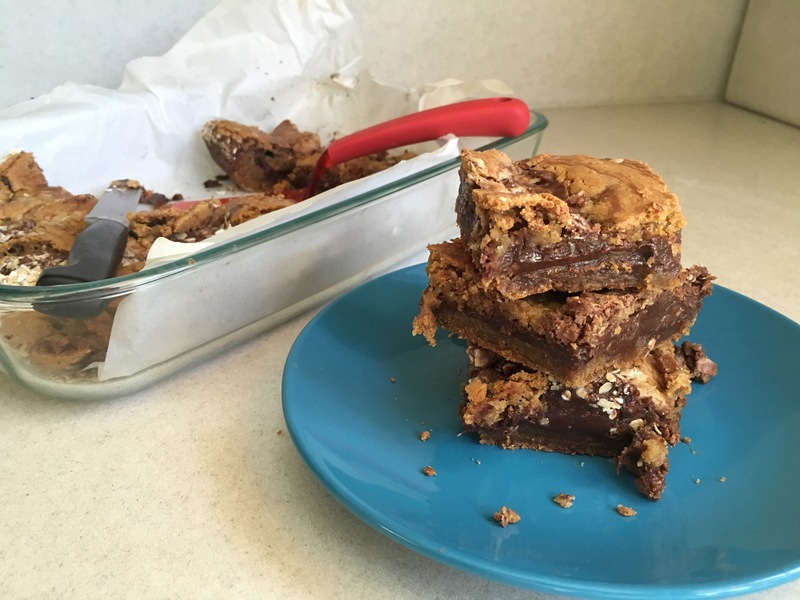 This entry was posted in Bars, brownies and bars, chocolate desserts, Uncategorized and tagged Oatmeal Fudge Bars, Oatmeal Fudge Brownies. Bookmark the permalink.